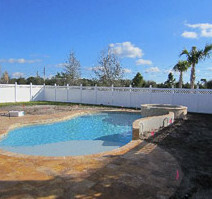 Pool Construction - Universal Landscape, Inc. In serving our customer’s, we have performed the installation of many waterfalls & landscapes dealing with both new and existing swimming pools. 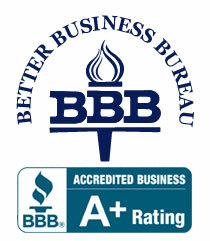 With over 25 years of experience in this field, we have worked with many different pool builders, both good and bad. This article addresses some common challenges with landscapes & pools we have had a number of customer’s come across at times, even with a good pool contractor. 1) Placing wood planks or boards on the lawn or tarps to travel on if the walking is excessive. These same wood planks, boards or tarps should be placed and removed at the beginning and end of work for each day. 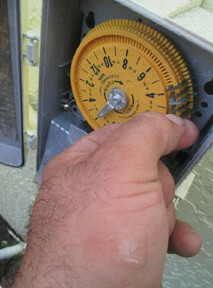 If they are left in place after the work for the day is completed, this can further stress the lawn. While these preventative measures can aid protecting, if not removed they can hinder the new lawn from being able to ‘breathe’ and from receiving the required water it needs that day to recover. 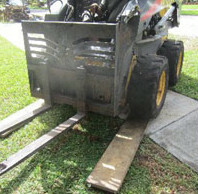 Note: Thick 2″ Planking (as in the photo top left) can also help to protect sidewalks & lawns from trucks & heavy machinery. 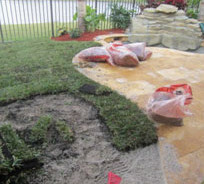 Extended heavy wear, many days, weeks, months of work, will often lead to the need of some sod repair. Some yards more than others. Drier lawns will resist wear more than moist lawns. This is the challenge and it depends a lot on the condition of the drainage of the soil of your property and the sun vs. shade characteristics of the lawn area(s). Heavy shade, weaker lawns, more easily damaged. Choosing between a weak and healthy lawn area, to use for rear entry, if you leave the good area alone and replace the weak, you’re giving the weak area a new start. If adjustments to grade and drainage can be made to improve the area, a good time to do so. If you stop watering at least a couple of weeks to a month before construction begins, this can significantly help dry out the area, force the roots to go deeper and can be beneficial in requiring less sod to replace when the project is complete. A) Should I water & how much after the installers of the pool finish are done for the day? 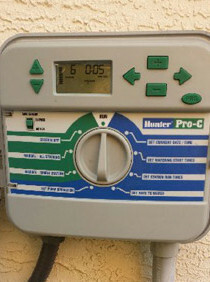 The irrigation should be set to water each day in the morning, as it is for our customers by us. This is not good. Toxins in the spray can damage the plants , they may suffer and recover or the plants could die. It depends naturally on the quantity of pool finish material that has gotten on the landscape or lawn. Neither like it. A small amount of misting, etc. may be ok and the plants may be ok. Wheel barrel loads or full shovels of excess finish, dumped in a landscape bed or lawn will likely kill any plantings they are dumped on if not removed and thoroughly rinsed off. What preventative steps can be taken to avoid this finish from being sprayed or spilled on the landscape? First – Careful workers. As mentioned before, this does not always occur and care in the work being done can help to avoid during the application, and consideration when disposing of the excess debris can often solve this challenge. Consideration in this sense meaning not intentionally dumping on the landscape and removing any excess debris with the crew that does the installation. Second – Using drop cloths or protective coverings. Similar to the interior or even exterior of a home being painted, drop cloths or tarps can be used to protect a lawn and landscape from overspray. What can be done if this damage occurs? 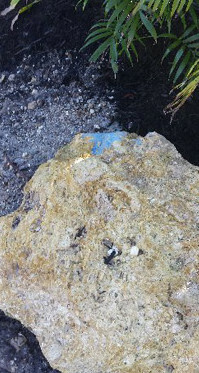 The blue in this photo is the finish dumped on the rock and on the soil of a finished landscape bed. * It contains toxins that can risk the landscape. First – take pictures of the area and save them in a file. Second – Clean off the plants, trees, stones or the lawn with water. 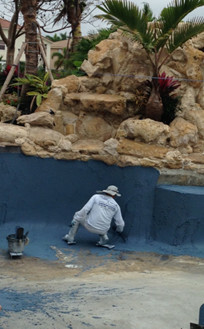 Rinse the area thoroughly so that any pool finish debris is removed from the area. If it is a shovel full or wheel barrel load, you can put on some gloves and with a garbage bag and a shovel clean up & dispose of the debris. The sooner the better. Not good to leave for days. Best results relate to a quicker response. Third – Contact the pool builder or the contractor who applied the finish immediately and notify them that there may be a problem. State that “the installer of the new pool finish had spilled, (sprayed or dumped )pool finish materials onto the landscape.” A responsible pool builder will be concerned and should take ownership. You may wish to apprise the pool builder if you have cleaned up the area yourself, or send them the photos you’ve taken by email, if you are willing to wait to have them come and clean it up. 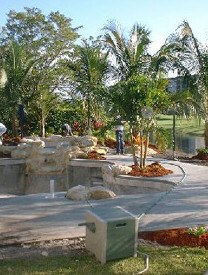 Four – if the plants, trees or lawn areas that were affected by the pool finish “splatter” or “spray” die off, at this point you have documented the damage, responsibly notified your pool contractor and they should next be expecting a bill from you if they are not willing to resolve the problem and replace the damaged landscape. Yes & this is exactly another reason why we always suggest installing drainage on any property where there may be a need to aid the runoff. Not only can the drainage improve the health of the yard and aid the removal of surface and roof water, it can be a benefit when cleaning off a pool or patio deck as you are experiencing. The problem is that the pool finish, if not washed away out of the drain already, which is a possibility from the rains, could form a blockage in the 4″ drainage lines if large quantities were dumped into it and not washed through. An easy test is to check if the drainage is working during a heavy rain or by running water into it yourself. 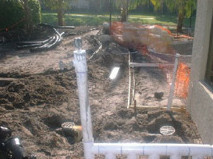 There are often 2 types of drainage setups for the rear pool and patio areas – for more information on drainage set ups, you can visit our drainage page on this site. 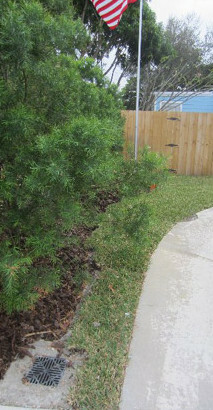 First, set up the lines run downward, from the back of a property dispensing naturally into a neighborhood drainage easement. Best way to test this, depending on how the exit point drain is installed, is to simply run a hose into a drain by the pool or patio that was dumped or washed into. Look for washout. If it does not wash out and you are receiving a buildup, then the grates of the drains will need to be removed and the lines cleared out. Similar to an occurrence of plumbing lines being cleared when there is a backup inside the house. Second set up the exit points of the drain are on an easement with a body of community water behind the property. For this set up, the same process of running water in the drain points where the pool finish material was washed into, and also in the line, before that entry point will need to be done. However, precautions should be taken from allowing this material to wash into the water basin, behind property. It’s never a good thing for life in the pond, to allow toxins to enter it when it can be avoided. Garbage bags and strainers should be used if available, to help clean up the pool finish debris that exists the evacuation point of the drainage system by one or more, while one person fills the drain with water by a hose at the entry point. At this point of the pool construction can present an issue and it’s common enough that we felt it maybe of service to some people to have knowledge. So, when you’re near the end of the completion of your pool and your landscape is installed, pay attention to this last stage before the pool builder’s final inspection or when the pools interior finish is installed. 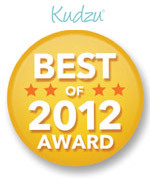 This can help save money and aggravation. I hope some may find this information helpful. 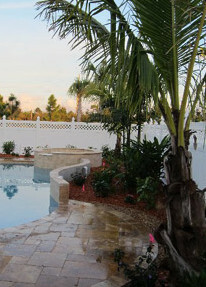 Answer : Yes, you can install the landscape after the pool is completed, with a couple of points of exception. The photos to the right are a prime example of this. 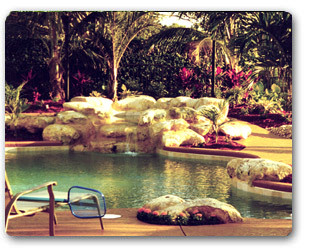 The swimming pool was built from start to finish, and the landscape and irrigation was installed afterward. We deal with both situations commonly, some pool builders will insist one way or the other, but the project can’t pass a final inspection, in any order, unless the grade is adjusted properly with new sod under the new or existing fence gate entry / exit points. 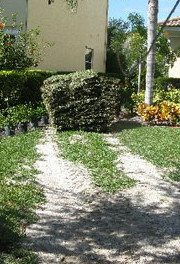 The situation of landscaping afterward, places the caution then on the landscape installers more so. To avoid spilling any large wheel barrel loads of soil into the newly finished pool. Such an occasion is extremely rare. 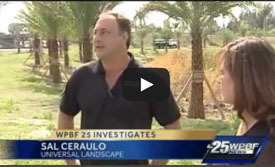 If such an incident of a lot of soil, either from work or more likely, a broken irrigation line or poor drainage and decking plan where the new grade improperly dumps water & soil washout into the pool. Absolutely, yes, in most cases, whenever possible. The larger trees, palms, boulders or integrated hardscape elements such as retaining walls even, should all be installed before even the decking is installed. The reason, usually spacing. Once the deck is in place, it can be difficult with many average size lots or smaller properties to install larger, machine size material. Fences also can provide a challenge, and as neighborhood’s & properties vary in spacing available, an installed fence also presents a challenge to install larger material, that is not there beforehand. Now if the property is so large… that machine access is not a problem at any point before the fence is installed or re-installed, then it can be done at the time of the pool’s completion if desired. Most often, most homes, there is limited spacing and any large material should be installed so that the decking does not have a chance of being compromised during installation. Also, the new deck can then even be better customized if it is desired after the trees are installed. 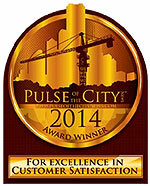 We often design the entire project, pool layout, decking, waterfall, landscape, entertaining areas.. etc. This is a common question and yes large stuff first. First let’s define “a lot” : A lot would be the quantity of a wheel barrel of soil or more. Dirt and dust can often get into a new pool in a number of ways, branches, leaves, etc. and no damage to occur. But a healthy amount, that actually can turn the water color darker, or make it cloudy, action must be taken, and the sooner the better. If this happens, if “a lot” of soil gets into the pool, the pool must be cleaned immediately and throughout the following days, possibly one to three times a day, depending on the amount of soil washout from the drainage or poor grade most likely. A single wheel barrel of soil, while unwanted, could present less of a challenge than a poor grading receiving a pouring rain, or a broken pipe washing soil into a pool. With each cleaning, the pump filter media, should also be taken out and cleaned. When cleaning the pump basket & especially the pool filter media, be sure to use the hose on a strong setting and rinse the soil, collected debris out of the media til its clean. (Photo to Right shows two circular filter media, the white is clean, grey/ brown, still dirty.) There are chemicals that can help to quicken the process and protect your pool. Checking with local pool supply companies, or chain stores as “Pinch a Penny” in S. Florida will offer solutions to aid in the cleanup. For more related articles to stages of your pool or waterfall construction, helpful gardening or landscape design, planning & care tips, along with many of the other services we perform, we hope you’ll enjoy touring our site and that you find it useful. If you or someone you know is considering having a project performed, we hope you’ll keep us in mind, it is our pleasure to serve.